There’s no doubt that that kitchen is one of the priciest rooms in the home to renovate. With everything from new flooring and paint to worktops, cupboards, electrical and plumbing issues to consider, it’s not something you typically consider doing on a budget. You might have put off renovating your kitchen for years under the impression that you simply don’t have the funds for it. However you might be surprised at just how much you can do on a budget, it’s possible to completely transform your space without spending much at all. Here are some ideas! The cupboards are the main focus of the kitchen, so if yours are old, shabby and dated it will bring down the entire look. But you don’t have to completely replace them. If the door fronts are cracked, broken, rotten or worse for wear you can simply replace the doors providing the units are in good condition. If the door fronts are fine, take them off and give them a coat of paint. While this is an obvious fix for solid wood kitchen units, it’s completely possible to do so with cheaper MDF cupboard doors too. In some cases you will need to remove the vinyl first, otherwise use a cupboard paint designed for this material and paint over the top. Check out the paint aisle in your local DIY store, you’d be surprised at just how many options you have for painting kitchens these days. Replace the handles too, this alone can make a kitchen look much more modern. When it comes to home decor, trends come and go. However unlike paint or wallpaper which is easy to replace, tiles are usually up for many years because it’s expensive to replace them. Again, you have the option of painting them but another great choice is replacing with a backsplash. These are inexpensive to buy and unlike tiles are quick and easy to fit. 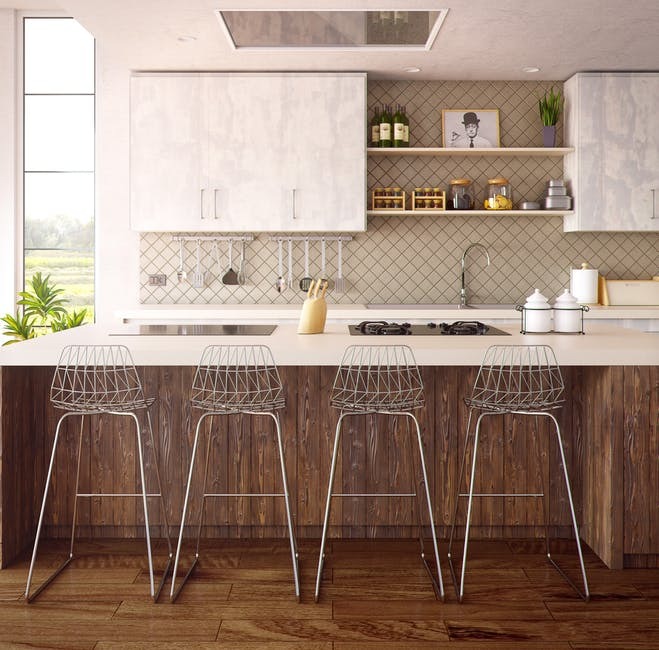 You can buy backsplashes in any design to suit your style and they can be cut down to any size. Tiles are a good choice for kitchen flooring, but as with wall tiles they’re expensive to buy and fit. Whatever you have down right now, as long as your floor is level simply have a sheet of vinyl fitted over the top. It’s hard wearing, easy to clean and is an inexpensive choice. Again you can get it in all kinds of styles and colours to suit your kitchen so is ideal for everyone. The last thing you want in your newly refreshed kitchen is old or even broken appliances bringing down the look. Appliances can be expensive but there are ways to make savings. Search for deals and discount codes, use vouchers and check out ex catalogue stores. These sell appliances that are from display, have slight imperfections or have been returned by customers but are generally almost perfect and have a massive chunk off the RRP. Had you considered sprucing up your kitchen on a budget? What Makes Up A Great And Affordable Family Car?